While preparing the crispy taro shreds for the Yee Sang (Raw Fish Salad) last week, I was reminded of this lesser known Chinese New Year snack. I have only had these a handful of times as a kid visiting friends’ homes during the festivities. If I remember correctly, it is called “Wu Har” in the Cantonese dialect. “wu” means taro and “har” means shrimp. They may have been named as such because they resemble shrimp fritters. Many vegetarian dishes are made with taro or yam and this could be a vegetarian substitute for shrimp. 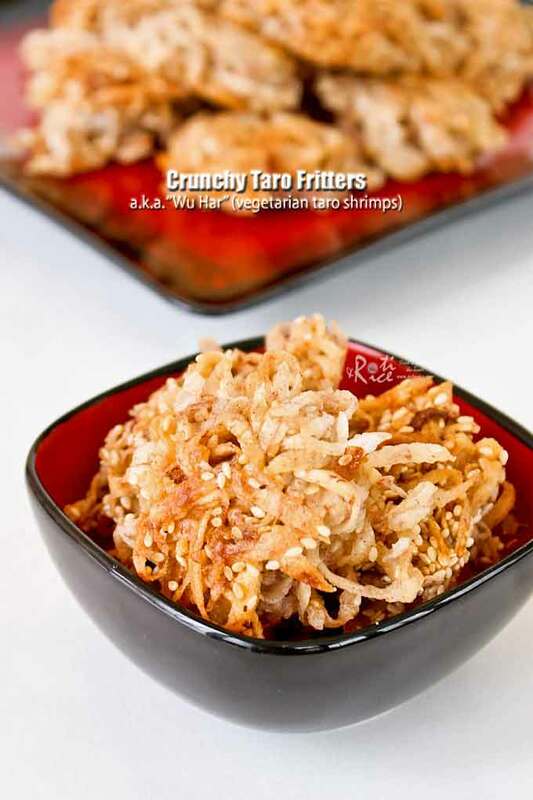 Although these savory Crunchy Taro Fritters are seldom served, they have somehow left an indelible mark in my memory. I have made them once or twice in the past and have thoroughly enjoyed them. Like all crunchies, they tend to go really fast and Ro-Taro and Ro-Jiro certainly made short work of them. They are a nice contrast to all the sweet treats being served at this time. This giveaway will be opened until 9:00pm Central, Thursday, February 17th. I will randomly pick a winner and make the announcement on Friday, February 18th. All the best! Let’s get cooking! Taro and five spiced powder are a happy marriage. Adding sesame seeds makes the marriage even happier. 🙂 These Crunchy Taro Fritters are big on taste and can be pretty addictive. 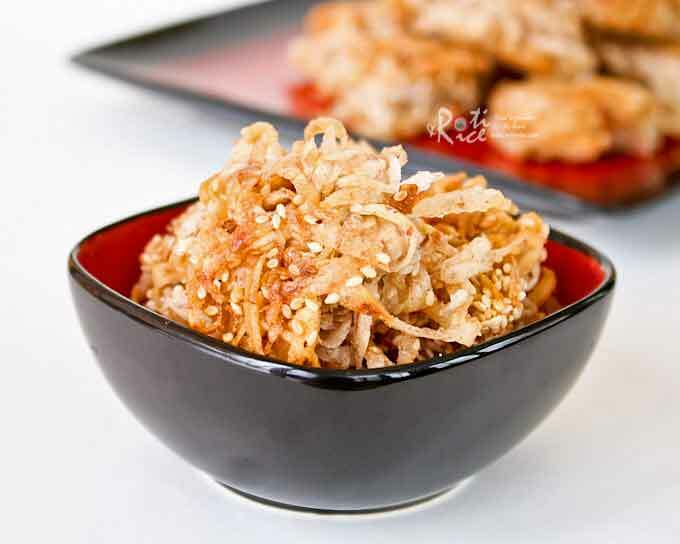 In a large bowl, add shredded taro, five spiced powder, and sesame seeds. In a small bowl combined rice flour and water. Pour onto taro mixture. Stir to get everything well mixed. Heat about one inch of oil in a wok or deep pan. Using a pair of chopsticks or thongs, take a small amount (about 1 tablespoonful) of taro mixture and drop gently into hot oil. Deep fry until golden brown and crispy. Remove and drain on paper towels. Store in air tight jars when cooled. Oo…looks like it could be addicting! Biren! Taro fritters are an awesome idea. I’m cooking for my friends next week and I’ve been trying to think of one extra dish to make. this is perfect. I love that it doesn’t have a huge list of ingredients. CSN really does own a million stores doesn’t it! I checked out luggage.com and what I really need is a carryon bag. I saw samsonite on there which is a great brand, but I also saw a super cute polka dotted one that I like. I hope I win! 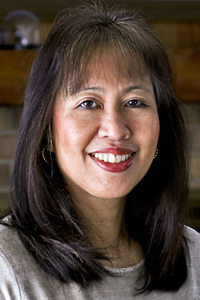 PS I saw your comment asking if I was party filipina. I’m actually full Korean. When I mentioned my cousin I was referring to my cousin in law. Sorry for the confusion! Have a great rest of the week Biren! Congrats on your award! Such a cute award too. I love these, Biren! I’m a bif fan of crispy taro and would love to try these. Bet my kiddies would love them as much as your boy did also. I was expecting shrimp in these though because of the name. Nonetheless, these look so yummy. Thank you for sharing this recipe and thank you for another CSN giveaway opportunity. What fun fritters!! Awesome giveaway too! Thanks for the chance to win 🙂 You know I already follow you everywhere, haha. this dish looks fantastic. is tarot root the same thing as daikon? there are wonderful daikon rice cakes that i have had once, but haven’t been able to make at home. thanks for sharing this. i always love learning about the food of different cultures. cheers. Looks so yummy 🙂 We’d love for you to submit this recipe to dishfolio.com! Biren, how could you not have posted these things earlier?!? They look incredible. I will definitely be giving these a try (if I can find taro in my little red-neck of the woods). Congratulations on the wonderful award. Well deserved, indeed. I love taro but have never had these before! They look delicious and I think this warrants a trip down to Chinatown to pick some taro up! i would love to get the bags! thanks! The dark red Samsonite look great. Love the fritters. Looks so good! Put a bowl of these on the table, and you will have, “now you see it, now you don’t”!! The CSN website isn’t working for me, but that’s a great giveaway! And those fritters look so good. I usually don’t make fried food (it always goes off), but those are tempting. We used to live in Hawaii and loved taro! I love taro chips, so I know I would love these taro fritters!!!! I have never eaten taro. I think this looks fantastic, but I can’t even imagine what it must taste like. So this is a must try for me! I have never eaten taro, so this is a must try for me! Your taro fritters look completely delicious and very addicting Biren! I like the five spice you used to season them too. I dream about getting one of the Samsonite Silhouette 12 Hardside 26″ Spinner Suitcase. I love the rolling luggage where all four wheels spin freely! So maneuverable! Love it! I have never tried crunchy taro fritters before, but my, oh, my they look good! Thank you for sharing…and for your kind words on my blog today. I hope you are having a happy and warm night! Biren, I’m a sucker for fried food. Can never resist. I can finish the entire bowl of your Taro! hahaha! Taro fritters??? I’d have never thought of that! Hmmm, these look good! Taro, sesame and 5-spice – what else do you need to say anymore? My kids would eat this in no time at all, and would not complain if I say it is a vegetable. Thanks for sharing. Biren~ you are ALWAYS broadening my horizons! I have never cooked with taro and I’m very intrigued. I’ll pick some up this week! Omg..my parents were from Hong Kong and I have never seen this sort of thing! Taro is my absolute favorite flavor. Thank you so much! 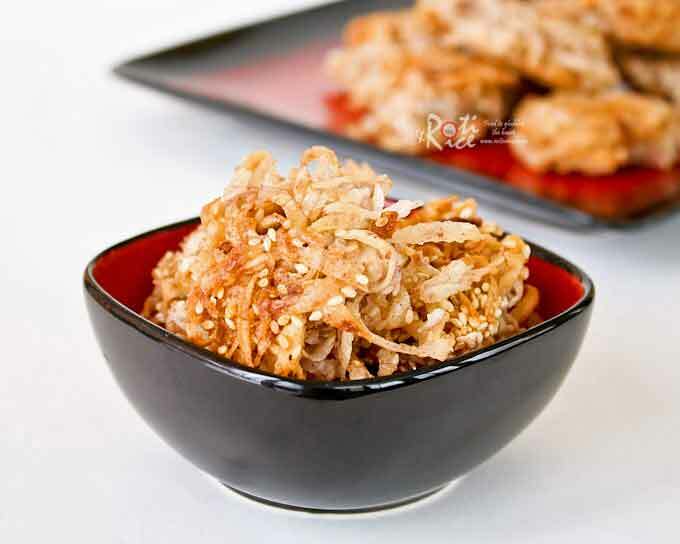 These fritters look absolutely wonderful, Biren…so crunchy and flavorful! I’m going to look for taro and I hope I can find it near me since I’d love to make these! I’ve had fried taro but never thought of fritters! I like anything fry and the crispiness of it. These sound crispy and so yummy! The Zero Halliburton Classic Edition 21″ looks dope! I follow! While I don’t have much of a use for luggage for myself, my daughter would love the “Beatrix – SK-1146 – Little Kid Papar Backpack” with the Owl on the front. 🙂 SO cute! I’d like to get a trunki for my little one. Those fritters look totally yummy…now I’m starving! I really like the Ducti – 10308YW – Police Line Do Not Cross Utility Messenger Bag in Yellow from CSN…..it would be perfect since I work for a police department, too! The Victoria leather messenger shoulder bag beckons to me! I’m new to your blog and your recipes look incredible! You can bet I’m a new follower! Thanks also for the chance to win the CSN gc. By the way, your tarot root fritters look so good. I’ve never seen this before. It looks like it would be really delicious though. Yeah! This recipe looks like fun. I’ve been pinning some of your Chinese New Year recipes to my Winter Holidays 2 board, and this one joined them.